This photo was taken on May 6, 2013 at 2:20 pm. The location was in the foothills of the Catalina Mountains near Tucson, Arizona. The "Take It!" came from seeing these blossoms from a distance on a real Saguaro Cactus and wanting to share how different this event is from the cell phone tower which could not even begin to give off this display of nature. 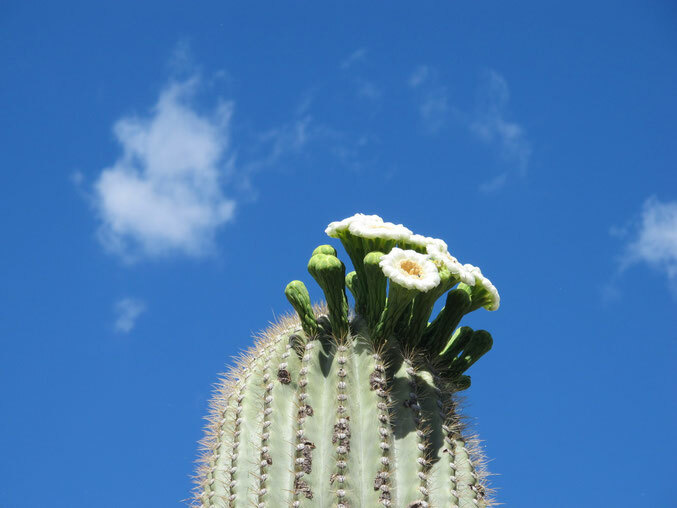 Almost all cactus, no matter what their shape or size may be generate flowers as a part of an annual cycle. The variety of colors ( almost all of which are vivid ) is amazing. Picking these flowers is very difficult as most have a thorn set that when encountered is quite painful. I think it is a fine example of look - but do not touch. The After Take: was quite enjoyable as always think it fun to describe to others some of the lore of the desert. This type of desert is called " Tropical " as it has so much vegetating. The other type of desert is : ''Arid" which has little to no vegetation and many times moves into being sand dunes due to the shifting of the wind. Arizona has some of this type of desert as well. I enjoy the tropical dessert far more than the arid. For those who have not been to the desert - I can highly recommend a visit for it is a wonderful place filled with both splendor as well as danger. Once again, another beautiful shade of blue sky!